Multifunctional bottle holders can be used for handrails, scooters, children's bicycles, wheelchairs, airport chairs, office chairs and baby strollers and other various sizes of bottles, such as water bottles, coffee cups, baby bottles and so on. The drink holder is adjustable for all bottles with a diameter of less than 95 mm. The 3 automatic springs in the cap design keep the bottle inside and prevent beverage spillage. 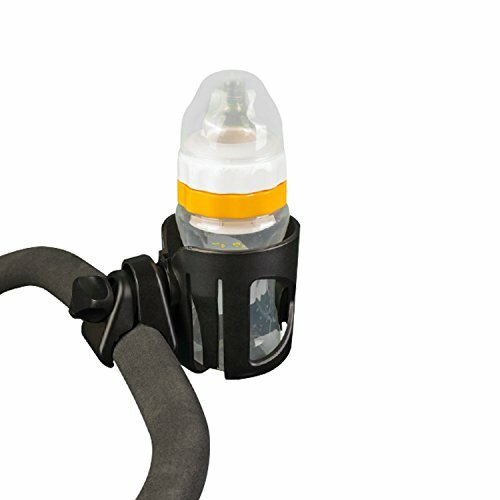 Durable plastic design, do not worry, if the road is not flat, the baby bottle cage is easy to fall. Water cup holders can be easily installed without additional tools. Plastic cup holders are suitable for all types of beverage containers. The cycle clamp can be rotated to facilitate attachment to different surfaces. Once it is locked there, it will not move and it's amazing. Easy to remove and will not damage anything. Lightweight, easy to wipe and clean. It is effectively designed to provide good functionality by becoming the most effective baby carrier storage solution for 95% of strollers, including MacLaren strollers, strollers, Chicco Strollers, Britax, Peg Perego, City Mini strollers and more. Mother's best stroller cup holder selection. Durable materials have been used for many years. Different occasions can be good partners for outdoor, tourism, airports, stadiums, offices, etc. If you have any questions about this product by QCKJ, contact us by completing and submitting the form below. If you are looking for a specif part number, please include it with your message.